In Februrary of 2009, Marlow Yachts introduced the new ME 70E Mark II complete with a solar array installed. Marlow Yachts' commitment to the environment, and particularly our seas, have resulted in the formation of our award winning Green Yacht Manufacturing Systems. In conjunction with other high-tech, green companies we have developed a unique Solar Power Hardtop that contributes up to 1.5kW of green electricity in sunny climates. It is estimated that in latitudes of 26 degrees (Florida) the ME-70 can remain off the power grid and enjoy greatly reduced operation of onboard generators. Seamless integration of solar power into the ships electrical system is accomplished by use of advanced Monocrystal Solar panels imbedded in the hardtop of the Explorer and sophisticated controls to ensure the cleanest power signature possible. The future of yachting in the southern climates will never be the same. Solar power is a cost effective and environmentally friendly way to supplement power to your electrical systems. While cruising, the new Mark II Series Explorer’s will see the most benefit of the new power configuration. The normal power requirements of a Marlow Explorer 70 underway is approximately 1400 watts, or roughly 1.5kW. This means that under normal running conditions the power for the ships systems could be supplied entirely by the solar panels, quietly and efficiently. This would reduce the generator run time and conserve fuel and generator hours. The savings in onboard power cost per kilowatt and generator maintenance can be enough to impact an owners bottom line operating expenses for the year. Docked power consumption is also positively affected by solar power. The panels would be able to supply power for onboard appliances eliminating, or greatly reducing, the requirement for shore cords, battery chargers or generators. For yachts at metered moorings this means normal onboard usage is supplied by the solar panel in lieu of the electric grid, substantially reducing the cost of ownership and wear and tear on equipment. As this exciting new high output technology develops further, we anticipate supplying all or a large part of onboard power requirements for air conditioning needs and shipboard appliances. 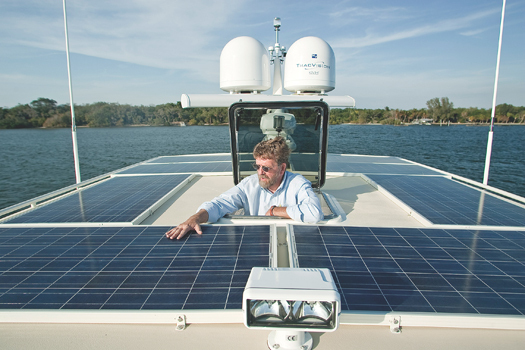 Captain Bill Pike of Power&Motoryacht Magazine spent some time on the ME 70E Mark II to experience and report on the innovative Solar Array installed on this yacht. Here he examines the Monocrystal Solar panels in their intergrative intallation. "It was a promising session. Although the array had apparently failed to produce the maximum 175-watt outputs our individual solar panels were rated for (most likely due to changing sun angles, cloudiness, and other meteorological factors), it had still averaged 125 watts per panel (25 volts x 5 amps) for a total outlay of 1,000 watts (125 volts x 8 amps). No wonder the lights were burning bright, the drinks were going down super-frosty, and Capt. Jack Sparrow was coming through gin-clear on the flat-panel TV." Read his article on this technology and it's performance by clicking on the link below.